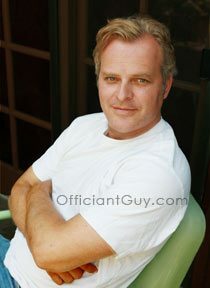 Officiant Guy > Chris > How do I find a wedding officiant near me? This is a question that many couples ask who aren’t necessarily attached to a church or a pastor. Many couples I speak to would prefer to have a civil wedding (meaning non religious wedding or secular wedding) than a religious one. Or, for some couples, their priest or clergy are either booked or not willing to perform a wedding outside of their church. And being that we are in California, there isn’t a justice of the peace that you can go to. So what do you do? I understand. Who do you trust to be your wedding officiant? 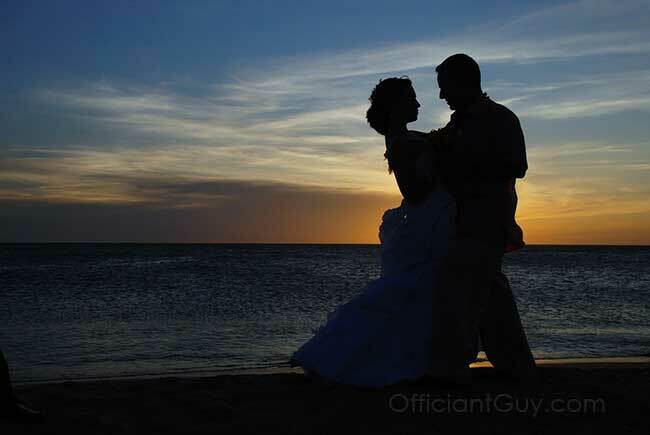 How do you know if that officiant is the right one for you? How do you know if your ceremony officiant is going to throw in some religious verbiage that offends you? What if you really want traditional religious wedding vows and your officiant doesn’t? Or what if your marriage officiant is a frustrated comedian who treats your ceremony like a part of his or her act? I am a professional wedding officiant. Here I am officiated a wedding ceremony in Los Angeles. I’ve been a wedding officiant for over twenty-five years. During that time I got a couple of law degrees, practiced tax law, had a family, and officiated thousands of wedding ceremonies. So, I guess you could say that I’m seasoned. I’ve learned over the years that trusting your instincts with any professional, is probably the best. But questions should be asked of your prospective wedding officiant to A) connect and help you feel comfortable and B) find out if they know what they’re doing. Often, in the case of busy couples or couples out of state or overseas, that communication happens via email. When you’re getting married, the only other person who is essential to your wedding ceremony is your wedding officiant. There are several parts to being a wedding officiant. It’s not just standing there reading a wedding script. It all starts with connecting though. 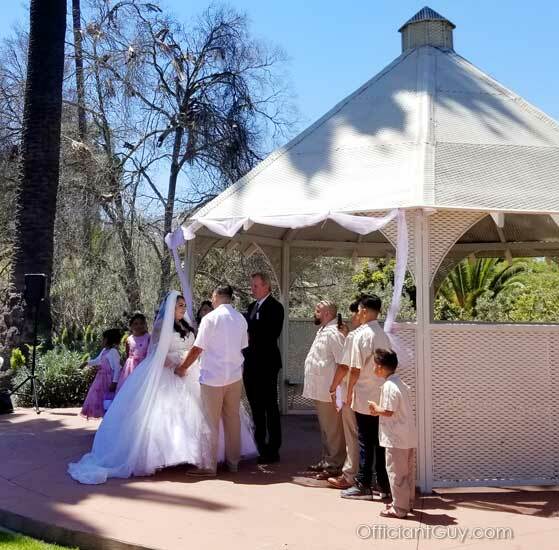 There are many formalities that a wedding officiant has to know, and many ceremony options such as announcements or protocol. I have officiated countless weddings, and have learned many different variations of every ceremony and tradition. Staying organized is essential as a wedding officiant. I have to manage much correspondence for weddings that might take place tomorrow, next week, next month or next year. I must communicate with and answer questions from brides, grooms, family members and wedding coordinators. I must manage expectations and a very busy schedule, and make sure that I have both the marriage license handy just before the ceremony and the wedding ceremony script. Since I spent years tracking billable hours as a lawyer, it’s second nature for me to collect all the relevant information for one client. Then I answer phones, text messages and emails, all in a timely manner. On rare occasions I miss a signal coming from one of countless variety of sources but I have been an authorized notary and wedding officiant for so long that, if necessary, I can easily adapt on short notice without missing a beat. I make it a point to be reachable by several different means most of the day almost every day. There’s also the paperwork of the marriage license. Most people don’t know how really important that legal document is. I am often called in to help from disappointed and frantic couples whose wedding officiant, even experienced officiants, messed up the marriage license. (There can be NO mistakes, smudges, cross outs, etc. on those marriage licenses. The County is very, very picky about that.) To me, since I issue marriage licenses constantly, it’s pretty rote. But, if an officiant performs only a few weddings a year, if they’re distracted or frantic, they could very well put the wrong information in the wrong box. It’s happened many times to many officiants that I bail out. The wedding officiant is also responsible for returning the marriage license, in a timely manner, to the County Recorder. Since I want to verify that my marriage licenses actually get to the County Clerk’s office, I drive over to the County Clerk Recorder, look for parking, park, navigate to the floor of the marriage license office, wait in line and hand deliver them to a human. Dropping it in the mail is considered acceptable, but it takes longer, and I have heard of them getting lost in the mail. No offense to the postal system, but it has happened. It happened to a friend of mine who was mortified. I don’t want that sort of embarrassment so I make sure to bring them in.